Getty	Here are 10 facts about the first Harry Potter book that you might not have known. Two decades after Harry Potter and the Sorcerer’s Stone made it’s way to the United States and graced the country with its pages, fans of the series are celebrating 20 years with Harry and the Wizarding World here in the U.S.
On September 1, 1998, the book was published by Scholastic, and although fans of the series celebrate its release every day of the year, it is still an extra special day for Harry Potter fans to nerd out and enjoy the series all over again. To pay homage to a series that changed the lives of millions of people around the globe, Heavy rounded up a few facts about the first book, author J.K. Rowling’s experiences getting it published, and the time she spent writing the earliest part of the magical world of Harry Potter. Although the image of the rejection letters above aren’t related to her attempts to publish Harry Potter (she wrote that the Harry Potter rejection letters were locked in a box in her attic), she shared two rejection letters she received when she was trying to publish her book The Cuckoo’s Calling, which was eventually published in 2013 under the pseudonym Robert Galbraith. Rowling shared the two rejection letters on Twitter to help encourage new writers to not give up on their dreams. She offered the rejection notices for “inspiration, not revenge” and masked the signatures. She also added that one of the publishers that rejected “Harry Potter” sent a rude rejection for “Galbraith” as well, according to Insider. In the early 19th and 20th centuries, it was common for female authors to disguise their gender identities by using male pseudonyms or their initials in an effort to be taken seriously as an author. Rowling is proof that the issue still existed in the late 90’s when she first published Harry Potter. In an interview with CNN’s Christiane Amanpour, Rowling revealed that her publisher wanted to conceal her gender from readers, hoping to appeal to both boys and girls. Rowling’s favorite chapter in the first book is reportedly Chapter 12, “The Mirror of Erised.” Harry stumbles across a mirror that shows what the viewer’s heart most desires, and for Harry that meant seeing his entire family, including his deceased parents. While the chapter itself is heartbreaking and a personal favorite of many readers, Rowling revealed that her favorite chapter in the entire series is Chapter 34 of the Deathly Hallows – “The Forest Again,” when Harry enters the forest to face Voldemort, thinking that the only way to defeat him was to die. 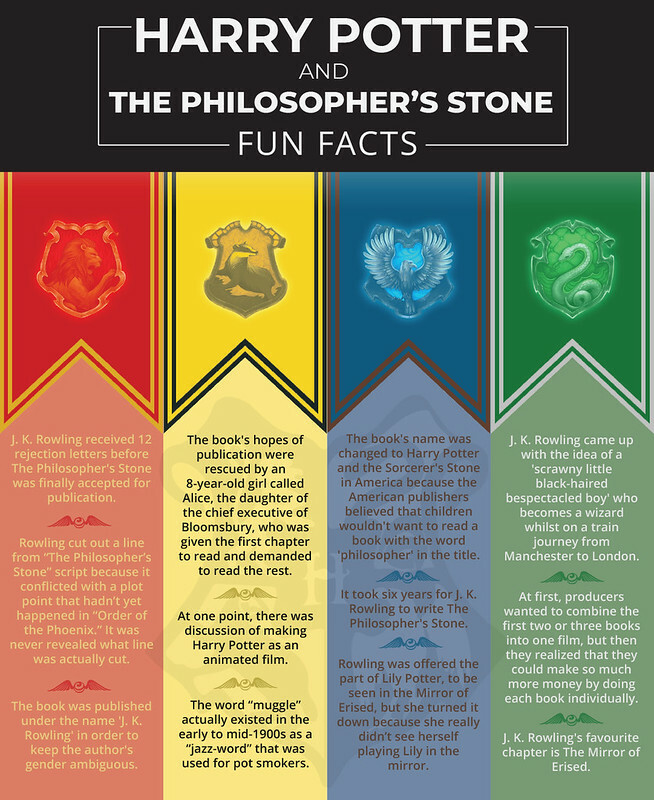 The book’s name was changed to Harry Potter and the Sorcerer’s Stone when it was picked up by American company Scholastic, because the American publishers believed that children wouldn’t want to read a book with the word ‘philosopher’ in the title. J. K. Rowling later stated that she regretted this change, and said she would have fought harder to keep the title it if she had been in a stronger position at the time. She was still a new author, and was eager to keep her publishers happy. In 1990, Jo Rowling, as she preferred to be known at the time, was moving with her boyfriend to an apartment in Manchester, and while riding on the train, Harry Potter’s identity was born. Game of Thrones: Why is Season 8 Delayed? When Harry Potter was first starting to form in Rowling’s head, her life was struck with tragedy, and she lost her mother to multiple sclerosis. According to The New York Times, her mother was dying as she outlined the early versions of the novels. After she passed, Rowling poured her pain and anguish into her writing, and Harry Potter became an orphan, something that Rowling could relate to at the time of writing. The first book opens with Harry losing his parents and being dropped off on the Dursley’s doorstep, which is where our hero’s story starts. A fairly well-known fact, Rowling started writing the first couple chapters of the book on “scraps of paper at a local cafe,” according to the description on the inside of the Sorcerer’s Stone hardcover novel. A struggling single mother living on welfare at the time, she was “in worst straits than I’ve ever been before,” she told CBS. However, she set the record straight with people who thought she was too poor to afford paper. GettyHarry Potter & the Sorcerer’s Stone 20th Anniversary release in the U.S. today. She told CBS that she was always writing when she was a little girl, and was just biding time teaching until she could get a book down on paper. Harry Potter was born in Rowling’s imagination decades ago, and she told CBS she started by drawing pictures of the characters. The drawings, which she once considered using in the books, are incredibly detailed, including pictures of Harry, his cousin Dudley, magical potions, Professor McGonagall. The author was initially offered the role of Harry’s mom when the first movie was being cast, but was apparently not interested. The character, who was instead played by Geraldine Somerville, first appears in the magical Mirror of Erised in the first book/movie. Harry Potter and the Philosopher’s Stone’s publication was rescued by an 8-year-old girl named Alice, the daughter of the chief executive of Bloomsbury, who was given the first chapter to read and demanded to read the rest of the book. Bloomsbury eventually agreed to publish the book, writing a check to Rowling for a mere 1,500 pounds. Rowling was also warned that she’d make no money in children’s books, but in a matter of years, she easily proved them wrong. Let’s all stop and give thanks to Alice for helping to publish and give life to our beloved Harry Potter! To pay homage to a series that changed the lives of millions of people around the globe, Heavy rounded up a few facts about the first book to share with fans. Enjoy!